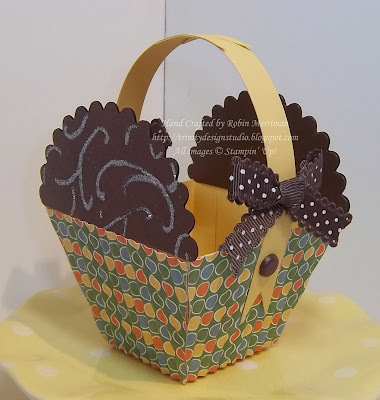 Trinity Designs: Cupcake Sneak Peek! 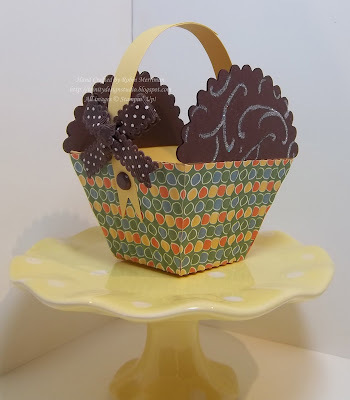 So after posting my Cupcake Basket Tutorial on Saturday, I just couldn't stand it - I HAD to decorate that yellow cupcake! And the perfect Stampin' Up! products to do it with are from the upcoming Idea Book and Catalog. Yes, a Sneak Peek for you!! The Designer Paper I used for the wrapper is from the new Just Add Cake pack. All of the paper in that set is so fun - perfect for birthdays and celebrations of all kinds! Did you see the RIBBON?!! Look how cute! It's Chocolate Chip Scalloped Polka-Dot Grosgrain - adorable! I know these two new products are going to be on your wish list for July 1st! They are just too fun! My catalogs are in the house now so if you want to reserve one, you need to e-mail me! Host a stampin' party or card class in July or August and you can get your catalog EARLY - on June 20th. And it's FREE! My gift to you! Have a great Monday stampers! I hope you enjoyed the sneak peek! Check back tomorrow for another project idea. I have a LOT to show you this week! As I said in my e-mail -- this is so gorgeous and yum, yum!! Thank you so much for sharing this idea! !